Some of us aren’t the best cooks in the world. We all get a little bit messy sometimes, especially if we are trying out a new recipe for the first time. We hear so many tips such as “clean as you go” “race the microwave!” and “keep a bowl as a bin on the go”, but what happens when things go a little bit too far and these tips just won’t work? Take a look at this bunch of kitchen cleaning fails…we certainly wouldn’t like to be the ones to clean them up! Well, how has this even happened? 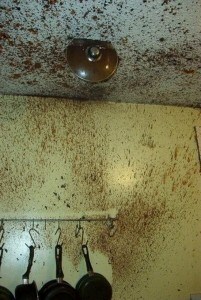 A glass jar of chocolate spread shouldn’t go in the microwave. Ever. If you want your spread warm, decant it into a microwave safe bowl to avoid this total disaster. Bye, bye microwave. 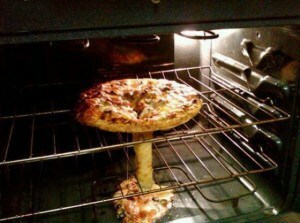 Wow, a pizza volcano! Once again, we’re not too sure how this ever could have happened. The middle fell out and created a new pizza. Amazing. That’s going to take a lot of scrubbing. If walls could talk…they’d say HOW? Not only is there an almighty splash stain that looks like something out of the TV show Dexter, the pan lid is actually stuck in the ceiling. 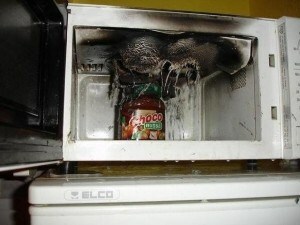 We’re imagining some sort of spaghetti bolognese exploding, but who knows how this incident occurred. There’re no two ways about it…you’re gonna need a new kitchen. 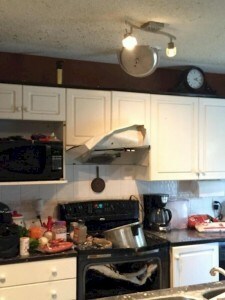 There are so many questions…how did the pan lid get stuck in the ceiling? how did the pan fall through the stove? what happened to the extractor fan? What were they trying to make? Absolute, categorical fail. 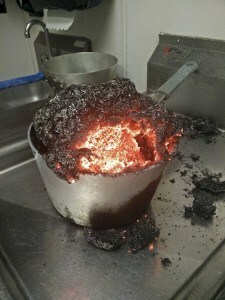 Please don’t ever try to cook again. Ever. 5. Brownie points for this fail! 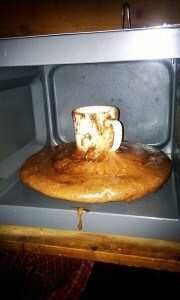 So reddit/u/hansworschd tried to make a brownie in a cup….the most amazing thing about this is that there isn’t anything left in the cup. It’s almost like art, so round! Good luck cleaning that microwave. Reddit user Skiddle1138 forgot that he was making caramel and accidentally created this monstrosity instead. I think that pan will have to go in the bin once it’s cooled down, which will probably take a few years! Reddit user Imperaptor was asked by his brother to help him clean the kitchen. 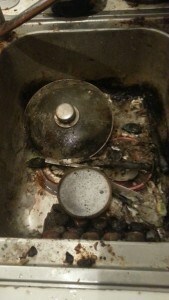 This was the sink. Can you imagine the rest of the kitchen? Gross. Use the timer on the microwave to do a quick clean- wipe the surfaces, put dishes away. Putting a cup of water with lemon or vinegar in the microwave can help to steam away the dirt to make it easier to clean. Clean tile floors with baking soda and water. Use lemons to remove stains from your chopping board. Premier Oven Clean can help you keep your kitchen looking great, by professionally cleaning your oven. We can clean both gas and electric ovens, inside and out. You’ll be able to use your oven immediately afterwards, with no waiting around for fumes to clear. It’s incredibly important to have a safe and hygienic kitchen, so let us help! Contact us for more information.